Over the last two decades, molecular imaging has been established as a valuable technology, aiming at visualization and characterization of biochemical processes on a molecular level in isolated cells, tissues and higher organisms. 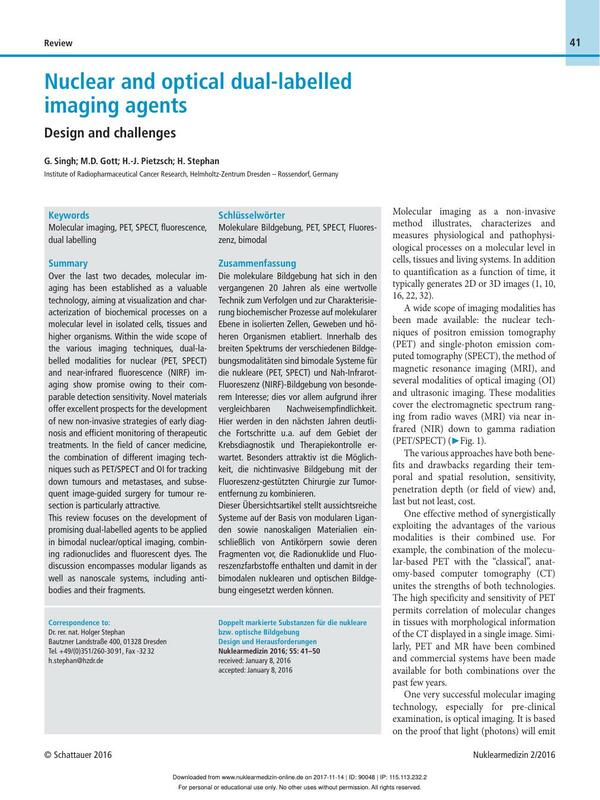 Within the wide scope of the various imaging techniques, dual-labelled modalities for nuclear (PET, SPECT) and near-infrared fluorescence (NIRF) imaging show promise owing to their comparable detection sensitivity. Novel materials offer excellent prospects for the development of new non-invasive strategies of early diagnosis and efficient monitoring of therapeutic treatments. In the field of cancer medicine, the combination of different imaging techniques such as PET/SPECT and OI for tracking down tumours and metastases, and subsequent image-guided surgery for tumour resection is particularly attractive. This review focuses on the development of promising dual-labelled agents to be applied in bimodal nuclear/optical imaging, combining radionuclides and fluorescent dyes. The discussion encompasses modular ligands as well as nanoscale systems, including antibodies and their fragments. Die molekulare Bildgebung hat sich in den vergangenen 20 Jahren als eine wertvolle Technik zum Verfolgen und zur Charakterisierung biochemischer Prozesse auf molekularer Ebene in isolierten Zellen, Geweben und höheren Organismen etabliert. Innerhalb des breiten Spektrums der verschiedenen Bildgebungsmodalitäten sind bimodale Systeme für die nukleare (PET, SPECT) und Nah-Infrarot-Fluoreszenz (NIRF)-Bildgebung von besonderem Interesse; dies vor allem aufgrund ihrer vergleichbaren Nachweisempfindlichkeit. Hier werden in den nächsten Jahren deutliche Fortschritte u.a. auf dem Gebiet der Krebsdiagnostik und Therapiekontrolle erwartet. Besonders attraktiv ist die Möglichkeit, die nichtinvasive Bildgebung mit der Fluoreszenz-gestützten Chirurgie zur Tumorentfernung zu kombinieren. Dieser Übersichtsartikel stellt aussichtsreiche Systeme auf der Basis von modularen Liganden sowie nanoskaligen Materialien einschließlich von Antikörpern sowie deren Fragmenten vor, die Radionuklide und Fluoreszenzfarbstoffe enthalten und damit in der bimodalen nuklearen und optischen Bildgebung eingesetzt werden können. 1 Achilefu S. Introduction to concepts and strategies for molecular imaging. Chem Rev 2010; 110: 2575-2578. 2 Azad AK, Rajaram MV, Metz WL. et al. gamma-Tilmanocept, a New Radiopharmaceutical Tracer for Cancer Sentinel Lymph Nodes, Binds to the Mannose Receptor (CD206). J Immunol 2015; 195: 2019-2029. 3 Azhdarinia A, Ghosh P, Ghosh S. et al. Dual-Labeling Strategies for Nuclear and Fluorescence Molecular Imaging: A Review and Analysis. Mol Imaging Biol 2012; 14: 261-276. 4 Azhdarinia A, Wilganowski N, Robinson H. et al. Characterization of chemical, radiochemical and optical properties of a dual-labeled MMP-9 targeting peptide. Bioorg Med Chem 2011; 19: 3769-3776. 5 Backer MV, Levashova Z, Patel V. et al. Molecular imaging of VEGF receptors in angiogenic vasculature with single-chain VEGF-based probes. Nat Med 2007; 13: 504-509. 6 Barreto JA, O’Malley W, Kubeil M. et al. Nanomaterials: applications in cancer imaging and therapy. Adv Mater 2011; 23: H18-40. 7 Berezin MY, Guo K, Teng B. et al. Radioactivity-synchronized fluorescence enhancement using a radionuclide fluorescence-quenched dye. J Am Chem Soc 2009; 131: 9198-9200. 8 Boulay A, Artigau M, Coulais Y. et al. First dinuclear Re/Tc complex as a potential bimodal Optical/SPECT molecular imaging agent. Dalton Trans 2011; 40: 6206-6209. 9 Brizet B, Goncalves V, Bernhard C. et al. DMAP-BODIPY alkynes: a convenient tool for labeling biomolecules for bimodal PET-optical imaging. Chemistry 2014; 20: 12933-12944. 10 Cassidy PJ, Radda GK. Molecular imaging perspectives. J R Soc Interface 2005; 2: 133-144. 11 Chakravarty R, Goel S, Cai W. Nanobody: the „magic bullet” for molecular imaging?. Theranostics 2014; 4: 386-398. 12 Chen F, Nayak TR, Goel S. et al. In vivo tumor vasculature targeted PET/NIRF imaging with TRC105(Fab)-conjugated, dual-labeled mesoporous silica nanoparticles. Mol Pharm 2014; 11: 4007-4014. 13 Coogan MP, Doyle RP, Valliant JF. et al. Single amino acid chelate complexes of the M(CO)3 (+) core for correlating fluorescence and radioimaging studies (M = 99mTc or Re). J Labelled Comp Radiopharm 2014; 57: 255-261. 14 Edwards WB, Xu B, Akers W. et al. Agonist-antagonist dilemma in molecular imaging: evaluation of a monomolecular multimodal imaging agent for the somatostatin receptor. Bioconjugate Chem 2008; 19: 192-200. 15 Emerson DK, Limmer KK, Hall DJ. et al. A receptor-targeted fluorescent radiopharmaceutical for multireporter sentinel lymph node imaging. Radiology 2012; 265: 186-193. 16 Frangioni JV. New technologies for human cancer imaging. J Clin Oncol 2008; 26: 4012-4021. 17 Gasser G, Tjioe L, Graham B. et al. Synthesis, copper(II) complexation, 64Cu-labeling, and bioconjugation of a new bis(2-pyridylmethyl) derivative of 1,4,7-triazacyclononane. Bioconjugate Chem 2008; 19: 719-730. 18 Ghosh SC, Ghosh P, Wilganowski N. et al. Multimodal chelation platform for near-infrared fluorescence/nuclear imaging. J Med Chem 2013; 56: 406-416. 19 Gianferrara T, Spagnul C, Alberto R. et al. Towards matched pairs of porphyrin-Re(I) /99mTc(I) conjugates that combine photodynamic activity with fluorescence and radio imaging. ChemMedChem 2014; 9: 1231-1237. 20 Guo W, Sun X, Jacobson O. et al. Intrinsically radioactive [64Cu]CuInS/ZnS quantum dots for PET and optical imaging: improved radiochemical stability and controllable Cerenkov luminescence. ACS Nano 2015; 9: 488-495. 21 Hendricks JA, Keliher EJ, Wan D. et al. Synthesis of [18F]BODIPY: bifunctional reporter for hybrid optical/positron emission tomography imaging. Angew Chem Int Ed Engl 2012; 51: 4603-4606. 22 James ML, Gambhir SS. A molecular imaging primer: modalities, imaging agents, and applications. Physiol Rev 2012; 92: 897-965. 23 Juran S, Walther M, Stephan H. et al. Hexadentate bispidine derivatives as versatile bifunctional chelate agents for copper(II) radioisotopes. Bioconjugate Chem 2009; 20: 347-359. 24 Kimura RH, Miao Z, Cheng Z. et al. A dual-labeled knottin peptide for PET and near-infrared fluorescence imaging of integrin expression in living subjects. Bioconjugate Chem 2010; 21: 436-444. 25 Knight JC, Mosley M, Stratford MR. et al. Development of an enzymatic pretargeting strategy for dual-modality imaging. Chem Commun (Camb) 2015; 51: 4055-4058. 26 Kobayashi H, Koyama Y, Barrett T. et al. Multimodal nanoprobes for radionuclide and five-color near-infrared optical lymphatic imaging. ACS Nano 2007; 1: 258-264. 27 Kuil J, Velders AH, van Leeuwen FW. Multimodal tumor-targeting peptides functionalized with both a radio- and a fluorescent label. Bioconjugate Chem 2010; 21: 1709-1719. 28 Liu SL, Li D, Huang CW. et al. Efficient construction of PET/fluorescence probe based on sarcophagine cage: An opportunity to integrate diagnosis with treatment. Mol Imaging Biol 2012; 14: 718-724. 29 Longmire M, Choyke PL, Kobayashi H. Clearance properties of nano-sized particles and molecules as imaging agents: considerations and caveats. Nanomedicine (Lond) 2008; 3: 703-717. 30 Lutje S, Rijpkema M, Goldenberg DM. et al. Pretargeted dual-modality immuno-SPECT and near-infrared fluorescence imaging for image-guided surgery of prostate cancer. Cancer Res 2014; 74: 6216-6223. 31 Mammatas LH, Verheul HM, Hendrikse NH. et al. Molecular imaging of targeted therapies with positron emission tomography: the visualization of personalized cancer care. Cell Oncol (Dordr) 2015; 38: 49-64. 32 Mankoff DA. A definition of molecular imaging. J Nucl Med 2007; 48: 18N-21N. 33 Nunes P, Morais GR, Palma E. et al. Isostructural Re(I)/99mTc(I) tricarbonyl complexes for cancer theranostics. Org Biomol Chem 2015; 13: 5182-5194. 34 Ogawa M, Regino CAS, Seidel J. et al. Dual-modality molecular imaging using antibodies labeled with activatable fluorescence and a radionuclide for specific and quantitative targeted cancer detection. Bioconjugate Chem 2009; 20: 2177-2184. 35 Paulus A, Desai P, Carney B. et al. Development of a clickable bimodal fluorescent/PET probe for in vivo imaging. EJNMMI Res 2015; 5: 120. 36 Perez-Medina C, Abdel-Atti D, Zhang Y. et al. A modular labeling strategy for in vivo PET and near-infrared fluorescence imaging of nanoparticle tumor targeting. J Nucl Med 2014; 55: 1706-1711. 37 Phillips E, Penate-Medina O, Zanzonico PB. et al. Clinical translation of an ultrasmall inorganic optical-PET imaging nanoparticle probe. Sci Transl Med 2014; 6: 260ra149. 38 Pombo Garcia K, Zarschler K, Barbaro L. et al. Zwitterionic-coated „stealth” nanoparticles for biomedical applications: recent advances in countering biomolecular corona formation and uptake by the mononuclear phagocyte system. Small 2014; 10: 2516-2529. 39 Seibold U, Wangler B, Schirrmacher R. et al. Bimodal imaging probes for combined PET and OI: recent developments and future directions for hybrid agent development. Biomed Res Int 2014; 2014: 153741. 40 Stephan H, Walther M, Fahnemann S. et al. Bispidines for dual imaging. Chemistry 2014; 20: 17011-17018. 41 Thorp-Greenwood FL, Coogan MP. Multimodal radio- (PET/SPECT) and fluorescence imaging agents based on metallo-radioisotopes: current applications and prospects for development of new agents. Dalton Trans 2011; 40: 6129-6143. 42 Viehweger K, Barbaro L, Garcia KP. et al. EGF receptor-targeting peptide conjugate incorporating a near-IR fluorescent dye and a novel 1,4,7-triazacyclononane-based 64Cu(II) chelator assembled via click chemistry. Bioconjugate Chem 2014; 25: 1011-1022. 43 Wang B, He X, Zhang Z. et al. Metabolism of nanomaterials in vivo: blood circulation and organ clearance. Acc Chem Res 2013; 46: 761-769. 44 Wang CF, Sarparanta MP, Makila EM. et al. Multifunctional porous silicon nanoparticles for cancer theranostics. Biomaterials 2015; 48: 108-118. 45 Wang JQ, Pollok KE, Cai S. et al. PET imaging and optical imaging with D-luciferin [11C]methyl ester and D-luciferin [11C]methyl ether of luciferase gene expression in tumor xenografts of living mice. Bioorg Med Chem Lett 2006; 16: 331-337. 46 Wang W, Ke S, Kwon S. et al. A new optical and nuclear dual-labeled imaging agent targeting interleukin 11 receptor alpha-chain. Bioconjugate Chem 2007; 18: 397-402. 47 Wang Y, Miao Z, Ren G. et al. A novel Affibody bioconjugate for dual-modality imaging of ovarian cancer. Chem Commun (Camb) 2014; 50: 12832-12835. 48 Xu H, Eck PK, Baidoo KE. et al. Toward preparation of antibody-based imaging probe libraries for dual-modality positron emission tomography and fluorescence imaging. Bioorg Med Chem 2009; 17: 5176-5181. 49 Yazdani A, Janzen N, Banevicius L. et al. Imidazole-based [2 + 1] Re(I)/99mTc(I) complexes as isostructural nuclear and optical probes. Inorg Chem 2015; 54: 1728-1736. 50 Zhang Z, Liang K, Bloch S. et al. Monomolecular multimodal fluorescence-radioisotope imaging agents. Bioconjugate Chem 2005; 16: 1232-1239.